Sometimes you go to a big town, just to go to a small town. Or at least that’s what happened when Edible Skinny spent Martin Luther King weekend in San Francisco. While in SanFran the Thomas Gals checked out the quaint by way of classy Tiburon. 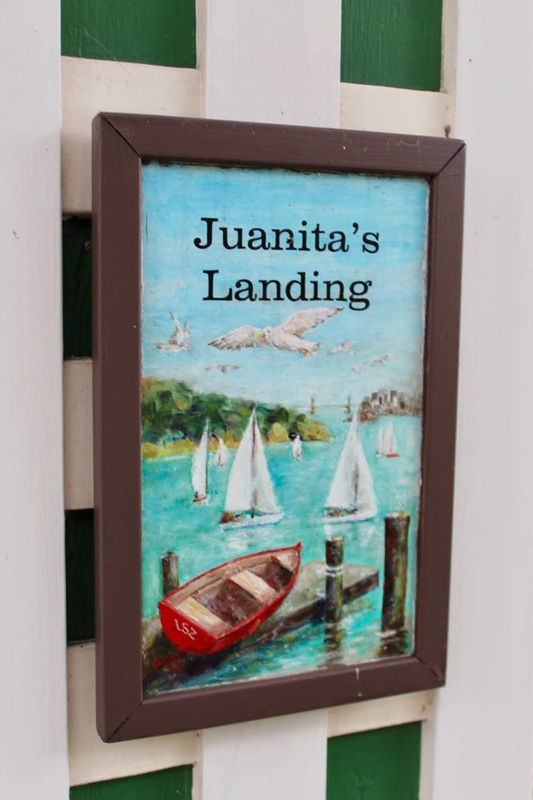 With a current population of 8,600 people the town of Tiburon runs at an undemanding pace. 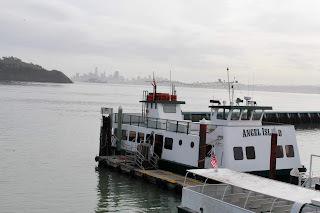 Located just north of San Francisco, in Marin County, California it is accessible by ferry from downtown San Francisco, as well as by car from Highway 101. 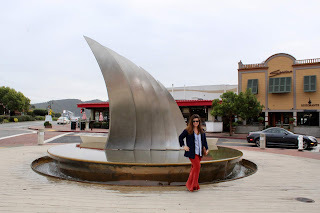 The city's name derives from the Spanish word tiburón, which means shark (inspired by the prevalence of locally native leopard sharks in the surrounding waters). Tiburon's Main Street has been preserved as it was when the town was a Gold Rush train town and lumber yard. 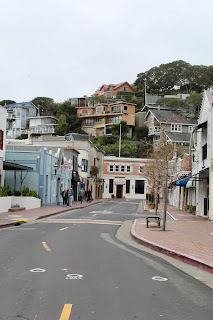 The scenic "Ark Row" shops are actually housed in turn of the century boat houses that were converted into homes and shops when the lagoon between the Tiburon peninsula and the neighboring island of Belvedere was filled in. It’s a great place to wander and find a vista meal, which is how Kelly and I ended up at local watering hole Servino! 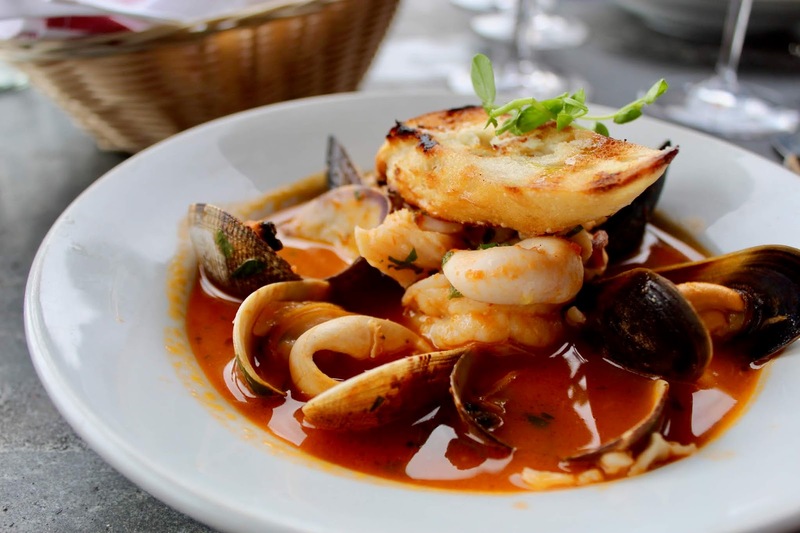 This dockside restaurant and bar is owned by Angelo Servino, the Dionysus of Tiburon. (Aptly nicknamed after Warren Buffet, the Oracle of Omaha, dined in his restaurant twice in one week… once with Bill Gates). It was a warm January day, so Kelly and I chose to enjoy an al fresca meal watching the local ferries glide to and from San Francisco. But just in case, the restaurant houses stacks of blankets for those who get chilly billy. Claudia our server, and also a manager at the restaurant for the six years, gave us the skinny on the establishment. Servino been in business 40 years. Starting on Ark Row, and then moving into its current waterside space 20 years ago. Claudia suggested we start with a white wine and chose a glass of the 2017 Erste + Neue, a Sauvignon Blanc from Sudtirol - Alto Adige, for us. The wine’s name translates to “fresh and new.” It originated from the Sudtirol - Alto Adige region of Italy, an Austro-Italian wine region noted for the distinct Austrian influences on the wine industry due to the region's long history under the rule of Austria-Hungary and Holy Roman Empires. This Sauv. Blanc was perfect for a bright winter day, after the rain. We savored each unique sip with a with throw draped over our shoulder and boats quietly bobbing the sun. And because we were hungry (when are we not? 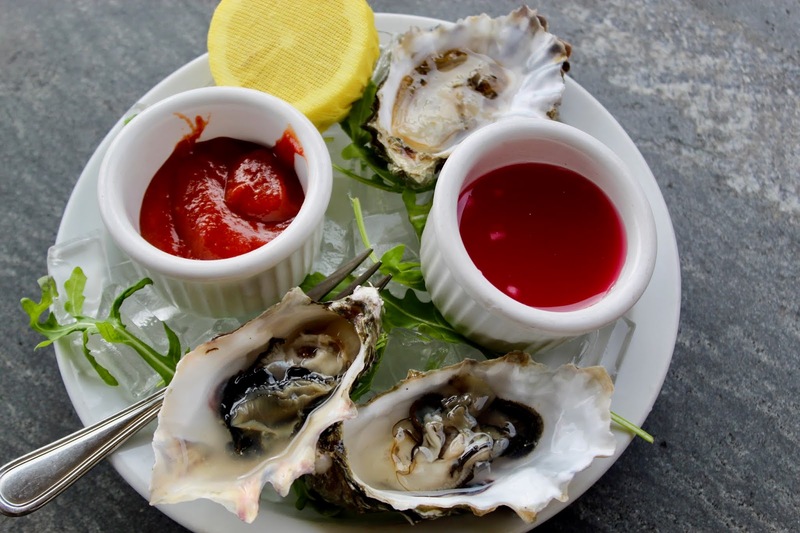 ), we paired it with some scrumptious Oysters Marin Miyagi from Tomales Bay. Ginormous and full of creaminess, Kelly was in Oyster Heaven!!! And nothing is better to soak in a stunning view than a little privacy! Upstairs Servino has an events space perfect for a corporate meeting or intimate weddings. The space, complete with outside deck and lounge area, overlooks the twinkling San Francisco skyline and sailboats leaning towards the sea. This seaside gem is the perfect backdrop for an unforgettable night, be it birthday or business. It was then on to large dramatic wines (this restaurant is owned by the Dionysus of Tiburon!!!). We chose a glass of the 2013 Romeo Cellars Semprini Vive “Old Vine” Cabernet Sauvignon from Napa. FUN FACT: the Romeo Family are personally friends with Angelo Servino. And because we were at an Italian restaurant we had to get a pizza. 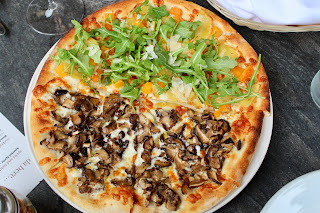 We decided to split the pie down the middle with two of Servino’s specialities: half Funghi, half Zucca. The Zucca was healthier comprised of Butternut Squash, Potatoes, Mozzarella, Arugula, and Shaved Parmesan. It was full of fresh fall tastes, earthy with a little bit of cream; the perfect cold weather snack for someone looking for a bite with autumnal flare. The Funghi was more Dionysus decadent made of Mozzarella Cheese, Crimini, Baby Shiitake, Thyme, and White Truffle Oil. It was the perfect hearty winter pizza. “It far exceeded my expectations,” chirped Kelly between munches. And finally we came to Kelly’s 3 favorite food groups: wine, coffee, and dessert. We swished more Romero Cellars wine, sipped on frothy cappuccinos, and savored a decadent flourless chocolate cake (made in-house by an aptly named chef called Leonardo). Topped with fresh made Whipped Cream, Hazelnuts, Chocolate drizzle with a side of Silvered Strawberries this dessert was big on taste, rich and robust, but not on size. This double decadence brought us straight back to the street of Florence.